As well as our website, we have a nice shiney Facebook Page where you can follow all our news and updates quickly and easily. All future news will be posted there. The children settled in well after the long summer break, and it is lovely to see all the new friendships forming now that our older children have moved on up to ‘big school’ and our new younger children have started. We have been spending time learning the rules and routines at playgroup and talking about how nice it is to play nicely and all be friends together. We have looked at how to stay healthy. The children practised washing their hands properly, brushing a giant set of teeth, did lots of fun exercise and made healthy treats. We have been getting out to the park as much as possible before the weather turns too cold! We have spent a long time on the theme of ‘Autumn’. We looked at which foods are around or being harvested at this time of year such as berries, oats wheat and root vegetables. The children enjoyed making and tasting some yummy food that keeps us warm and gives us lots of energy, such as flapjack, bread rolls, jam sandwiches, and vegetable soup. We discovered we had some very clever counters when we buried some potatoes in soil and challenged the children to find them all for us. We went for a muddy walk on a lovely bright and sunny day through Prestwold Woods to collect some big leaves to print with using autumn colours. The children produced some lovely pictures. We talked about what wild animals do when the weather gets colder and we made little clay hedgehogs. 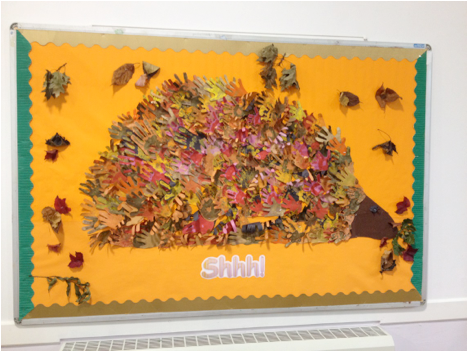 We also made a giant hedgehog called Heidi, on our display board, using lots and lots of handprints from the children! Heidi the Hedgehog on our Display Board! The year has flown by very quickly and we had a very enjoyable last term. We had some lovely sunny weather and spent much of our time outdoors, either in our playgroup garden or at the ‘little park’. The children love our visits to the park and always make us proud with how well behaved they are whilst we are out. We introduced our bright, colourful walking rope earlier in the year and the children all walk very sensibly with it and think it’s great fun to hold on to! We have had some successful fundraisers this term, starting with our Spring nursery rhyme concert, when our children all dressed up and looked very cute for their parents and grandparents and sang very beautifully! This raised over £125.00. Our Fashion show ladies night was a sell out and great fun as always and we raised over £280.00. Finally our annual end of term picnic, leavers presentation and sponsored obstacle race was a brilliant end to the year thanks to the glorious sunshine! 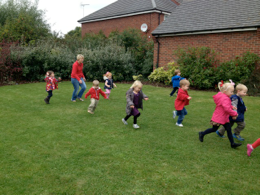 After playgroup on a Friday afternoon we all gathered under the shade of the trees on the ‘big park’ and had our picnic, and then our children who will be going up to big school in September were presented with a special gift from playgroup. After this the children had fun completing the obstacle course on the field while the sun continued to shine, and they all got a special medal at the end. The event raised over £235.00 for playgroup. Our committee do a wonderful job organising these pleasurable events which raise valuable funds to help keep playgroup going and I would like to say a massive thank you to all of them for all their hard work, their time and their enthusiasm throughout the year. Playgroup wouldn’t be here without them! Also a big thank you to all the parents and carers who come along to support our fundraising events. Burton on the Wolds Treasure Trail on Sunday 29th September! Our next fundraising event will be the Burton Treasure Trail on Sunday the 29th of September at the Playing Fields Pavillion, Towles Field 2pm till 4pm, when there will be a fantastic prize for one very lucky winner! £2.00 entry. Everyone welcome. Cakes and refreshments will be available all afternoon. Our Annual General Meeting and first fundraising meeting of the year will be on Thursday 19th of September at Burton on the Wolds Village Hall 8pm. Well all that remains is for me to say farewell for now to all the children who are leaving all of us at playgroup to go up to big school. We will miss you all but we know you are all going to have heaps of fun in class 1 with Mrs Tipper and Mrs Henshaw, and we will see you all when we come up for a visit in the new term! 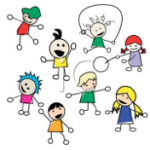 We would also like to say a big welcome to our new children who will be starting in September, and we are looking forward to another happy and fun filled year at Burton playgroup.